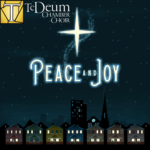 It will be Te Deum Chamber Choir’s first Christmas-season concert – done Te Deum’s way. That means audiences can expect a thoughtfully planned selection of a cappella gems that are fresh, festive and beyond the seasonal standards. The program includes fresh settings of carols by Jocelyn Hagen, Susan LaBarr, and Sofia Sӧderberg, as well as works by Walton, Poulenc, Tavener, and Pӓrt. This concert will be an immersive experience as you enjoy the sound and beauty of the Chamber Choir in a unique venue – a West Bottoms warehouse. Enjoy an intimate and interactive experience, with the Artistic Director and Te Deum Chamber Choir singers at a VIP reception immediately following the performance at the Create-It Studio. Enjoy seasonal wine and dessert as you connect with fellow concertgoers and artists. You don’t want to miss the unique experience as we raise funding to support Te Deum’s vision to transform humanity by sacred music! No physical tickets will be issued for this performance or the reception. Your name will be on the will-call list at the ticket counter, along with the number of tickets purchased.